In my previous post, I talked about protein, and touched on what amino acids are. Essentially, amino acids are the building blocks of proteins, or enzymes. Each protein has to have a very specific shape in order to work, and this is created by a specific sequence of amino acids. There are 22 amino acids in most living things, and all mammals use the same set. 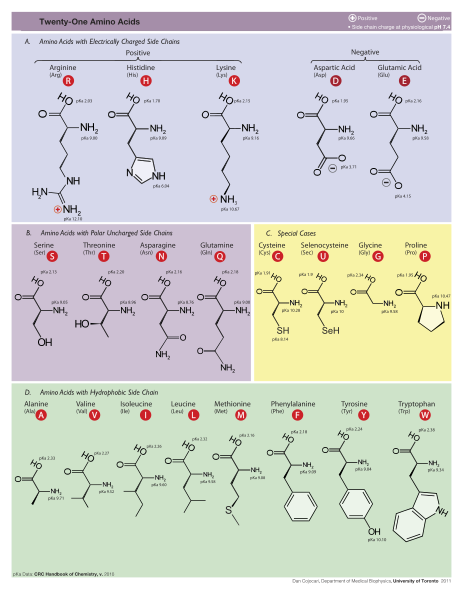 The full collection of amino acids - collect all 22! Because every protein has to have a specific amino acid sequence, it is very important for every cell to have an abundant amount of amino acids. Because of this, a cell has evolved different mechanisms for converting certain amino acids into others. For example, Alanin can be produced by the cell, so there is no dietary need to eat it. However, there are about 10 amino acids that dogs can not produce themselves. These amino acids need to be in a dog’s food, or serious deficiencies will result. Hence the word “essential”. These amino acids are absolutely essential to a dogs diet. How do you ensure that a dog in getting the proper amount? Most meat will contain all the necessary amino acids that your dog needs. A lot of plant protein is missing one or two of the essential amino acids. I supplement Tsuki’s food with both Spirulina and Bee Pollen, which I’ll talk about in later posts, to ensure that everything she needs is there. Spirulina and Bee Pollen are both “complete proteins”, meaning that they have all the essential amino acids available. Hi, Naruto-san, nice to see(?) you. I’m a reader of the blog that written by your partner. And a fan of Tsuki-chan. It is little bit difficult but very interesting to know about the dog’s health and amino acid and. I’m looking for the later post.